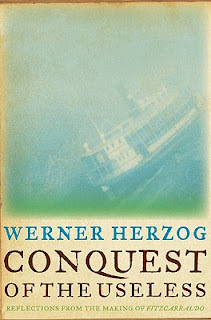 Conquest of the Useless is the largely unedited journal Herzog kept during his time in the Peruvian jungle filming Fitzcarraldo. Fitzcarraldo is an Irish rubber baron who wants to bring high opera to the rain forest and to do so he attempts to move a steam ship between two river systems over a mountain. 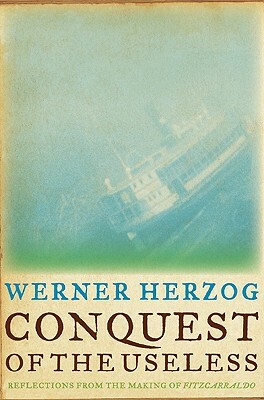 Herzog was ordered by the movie executives in California (a hilarious bit of the book where he was staying at Francis Ford Coppola's house) to move a model steam ship through the San Diego botanic gardens, but instead he chose to move a real steam ship through the real jungle because that's what his dream told him to do. Even the initial canoe journey to the location shoot echoes The Heart of Darkness and Coppola's own Apocalypse Now. Everyone gets malaria and dysentery, Mick Jagger and Jason Robards quit the movie. Klaus Kinski loses his mind. Kittens are eaten alive by chickens. Wives are bought and sold for the price of a jar of poison (for darts). A mad soldier invades Ecuador with his platoon of men and advances 30 miles into Ecuadorian territory. A villager stabs a spear at Herzog's belly. The film crew's own translator is a pathological liar who incites the villagers against the director. People break legs and arms. Floods destroy the set. Wars break out. Poisonous snakes and spiders are everywhere. From all this chaos somehow a film is made. Fantastic stuff.